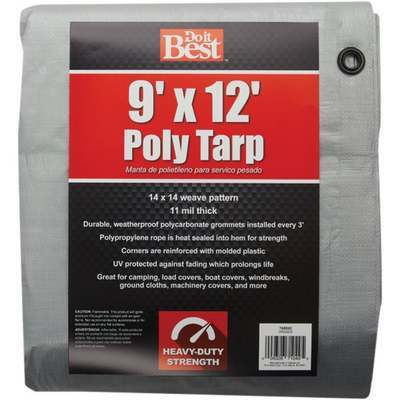 Tarps are constructed of polyethylene with a 14 x 14 weave pattern and lamination on both sides. A polypropylene rope is heat sealed into the peripheral hem. Durable, weatherproof polycarbonate grommets are located every 3' around the periphery. Corners are reinforced with molded plastic. Treated to withstand the ultraviolet rays of the sun. Waterproof. Packaged in a PVC bag with a hang tab and a sample swatch. Thickness: 11 mil. Weight: 340 grain.